We believe that every kite session should be enjoyable and inspire you to progress and boost your confidence as a rider. To that end we have designed a kite that allows you to escape your limitations and gives you the freedom to enjoy every aspect of Kiteboarding comfortably and full of confidence. The Escape’s smooth and predictable handling, bar feeling and controllable lift & boost immediately give he rider a feeling of safety and trust that inspires progression right from the moment you first launch it. Due to the adjustable bar pressure and bridle settings the Escape has a very large performance window, making it suitable for riders of different skill levels. Grow your skill and the Escape will grow with you! 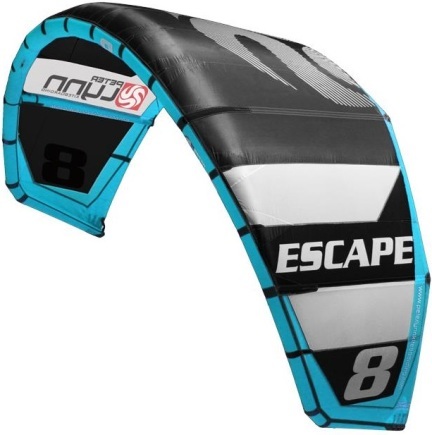 By developing the Escape along the demands of pro’s and kiteschools as well as incorporating the feedback from beginner and intermediate riders, we can safely say that the Escape ticks all the boxes in terms of ease of use, handling, kite feedback and performance. 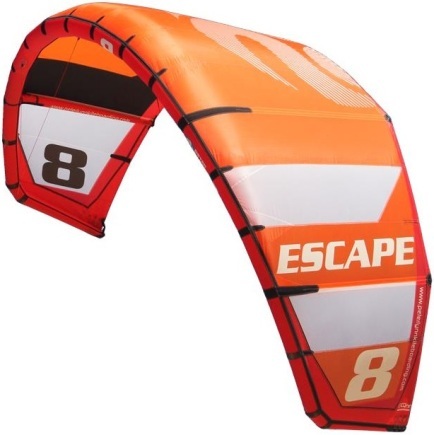 The Escape is one of the most comfortable and intuitive performing kites out there. Its stable and durable 4-strut design offers multiple trim options for customized handling and an incredibly broad performance range. Its balanced medium aspect ratio offers endless versatility at any level, its quick and direct turning is guaranteed to keep you stoked. This 3rd generation has a more performance orientated shape while at the same time retaining its user friendliness. The Escape’s balanced 4 strut setup gives the kite a clean middle section which delivers a ton of raw power. Its squared off wingtips make for quick turning and efficient use of the wind throughout the entire wind window. We tested this 11m Escape in a very wide wind range, because we had the moms, dads and hard working weekend riders, in mind. Kitesurfers who just have a few moments to ride and those moments aren't always the best ones. Nevertheless you want to go out, right now! Well the Escape has that wide usability range. Great low and high end. At its low end the Escape is an easy to ride, fast turning kite with a great relaunch. At its high end you have a great depower and nice sheet & go airtime kite. A bit heavy on the bar, but nice for the feedback. Attach that with a mellow lift and you have a comfortable feel in overpowered situations. Big air allrounders, expect a fast kite with a great float and stable on/off bar control. especially in its high end. You can't put enough pressure on the steering lines. High end a real sheet and go! All and all it is a nice kite if you don't want to spend to much money. Don't expect a flashy bar. It just has anything you need on it and nothing more. It was a very gusty and windy day including a lot of rain. But the kite was stable and still would give you the confidence to send it up for a nice flight. I am looking forward at testing with lower wind conditions. Because you can tell a lot more of its characteristics in low wind conditions. The kites seems to have some drag and it sits i bit deeper in de wind window. That will make it go a little bit less upwind but on the other hand it will give you more power in low wind condtions.